I am completely and irreversibly in love with the Ruth Galloway series by Elly Griffiths/Domenica de Rosa. Tomorrow is release day for #9 in this brilliant series. I should have my review up with this description of the book, but, I wrote it several months ago and somehow have managed to lose it on my computer. I did have a virus that wiped out loads of pictures and documents, and I fear that is what happened. Unfortunately, I didn't check until yesterday, when I was going to put the review on my blog for today. Since I am leaving for vacation in a few hours, I will have to redo the review next weekend when I return. So, for now, here is the cover description for The Chalk Pit. It is an amazing read, and even though I received an ARC, I will be buying the American and British hardcovers, because I enjoyed this book so much, as I have all the previous Ruth Galloway books. 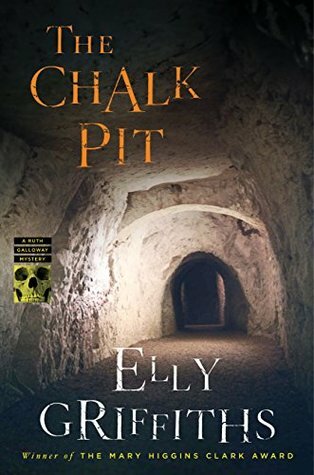 In the ninth Ruth Galloway mystery, Ruth and Nelson investigate a string of murders and disappearances deep within the abandoned tunnels hidden far beneath the streets of Norwich. Norwich is riddled with old chalk-mining tunnels, but no one’s sure exactly how many. When Ruth is called in to investigate a set of human remains found in one of them, she notices the bones are almost translucent, a sign they were boiled soon after death. Once more, she finds herself at the helm of a murder investigation. Meanwhile, DCI Nelson is hunting for a missing homeless woman, Barbara, who he hears has gone “underground.” Could she have disappeared into the labyrinth? And if so, is she connected to the body Ruth found? As Ruth, Nelson, and the rest of their team investigate the tunnels, they hear rumors of secret societies, cannibalism, and ritual killings. When a dead body is found with a map that appears to be of The Underground, they realize their quest to find the killer has only just begun—and that there may be more bodies underfoot. This is currently one of my favorite series. Looking forward to reading the latest. Aubrey, I'm always delighted to talk to another fan of this series! I think you will find The Chalk Pit an amazing addition to it. Thanks for stopping by to comment!